Microsoft has released the three new updates KB3192403, KB3192404, and KB3192406 as optional for Windows 7 Service Pack 1, Windows 8.1, and Windows Server 2008 R2 SP1, Windows Server 2012, and Windows Server 2012 R2. The company changed the updating process significantly in October for Windows 7 and Windows 8 client operating systems, and Windows Server 2008 R2, Windows Server 2012 and 2012 R2 server operating systems. Updates are now delivered as monthly rollups instead of individual patches. This means that every patch released for one of the supported operating systems is now included in the monthly rollup, but no longer available as individual updates that users can download and install. Microsoft furthermore distinguishes between security-only rollups, which it releases once a month covering all security updates for that month, and monthly rollups, which include both security and non-security updates, and include previous updates as well. Another recent change is the introduction of so-called previews for quality rollups. Microsoft picked the third Tuesday of each month for that. Basically, what is happening is that Microsoft releases the monthly rollup patch for the coming month as a preview on the third Tuesday of the month. Yesterday was the third Tuesday of October, and Microsoft released the updates KB3192403, KB3192404, and KB3192406 as a consequence. These updates are listed as optional patches. This means that Windows users and administrators need to check them first in Windows Update to install them. Note: Preview quality rollup patches should be considered as beta releases. It is not recommended to install them unless done for testing purposes, or if they fix an issue that you are experiencing on a Windows machine. The preview updates are available through Windows Update, but also via Microsoft's Update Catalog. Use the following link to open all available October 2016 Preview updates. New root certificate type to support Catalog V2 for Windows 7 Embedded systems. Improved proxy support in an authenticated proxy environment (telemetry, download of settings). Revised daylight saving time issues fixed. KB3192404: October 2016 Preview of Monthly Quality Rollup for Windows 8.1 and Windows Server 2012 R2. Shared drives becoming unavailable issue fixed. Memory leaks addressed in ISCSI WMI Provider. Addressed 100% cou usage LSASS issue on domain controller role machines. Fixed Office 365 integration issue with Windows Server Essentials 2012 R2. Fixed task scheduler issue where weekly scheduled tasks failed with ERROR_REQUEST_REFUSED (0x800710e0). 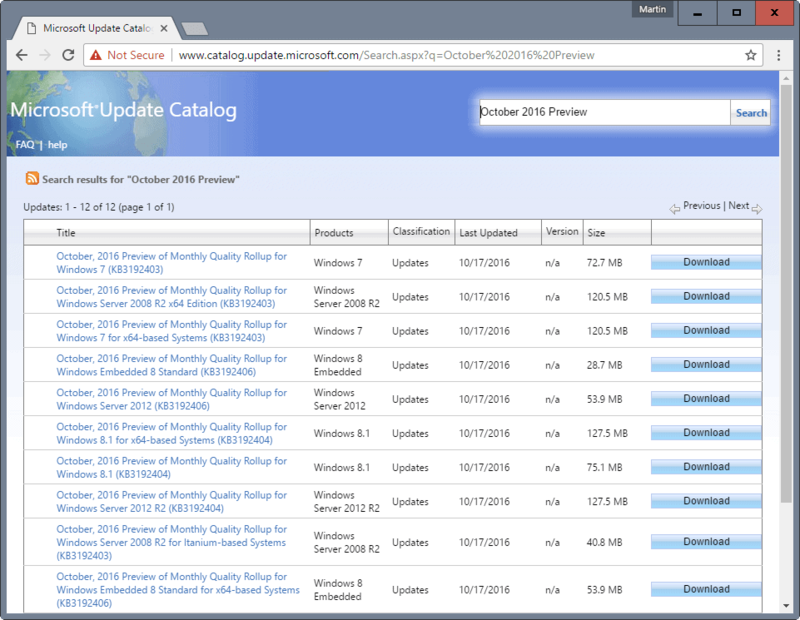 KB3192406: October 2016 Preview of Monthly Quality Rollup for Windows Server 2012. Fixed high CPU load in situations where a large number of files are open and folders are being renamed. Microsoft has released the three new updates KB3192403, KB3192404, and KB3192406 as optional updates for client and server versions of Windows. Are the individual updates contained in the roll-ups also available to download separately from the update catalogue? Dave no they are not. It is all or nothing. Going forward, it would really great if you could provide a download link every month for the “Security Only” Rollup, for those of your regular users here who still run Windows 7 or 8.1 and only want the updates required to ensure security. I always look forward to your monthly Bulletin explaining all the Microsoft updates – and adding an optional link where we can download the “Security Only” Rollup would be wonderful. Have already done so for October, and will do so in the future as well. Yes – I did locate the “Security Only” patch via the link you provided for this month, and am very appreciative that you will take the time to continue to do so in the future. I try to make the posts as useful as possible, and links to security only update downloads definitely makes the article more useful. Thank you ever so much, Martin! I trust people who gripe about Microsloth Products a lot more than the fanboys who promote them. All or nothing. Nothing then. Thank you. Agree. I permanently stopped all attempts to update my Win7 PC’s, months ago. Perhaps some skilled 3rd party will determine how to safely filter/analyze MS updates for easy custom installation…but like many others here — Linux is the long term solution. I disabled window 7 updates when I found about about win 10 spying. It seems MSoft want to push this spying technology down to Win 7 and bends are arms with these all or nothing rollup tactics. The mobile site has gone all crap again. I don’t wanna have to operate ghacks differently to every other site on the net. What’s with the awful sideways page swipes coming back? We will run a test soon for another version of the mobile site, stay tuned. The telemetry is back big time in the Windows 7 and 8 rollups. Woody Leonhard has the details in his blog at Infoworld. What’s this mean? More spyware and telemetry we’d have to deal with? Anybody who has more information about this would be most appreciated here. I do not know if Steve Gibson’s new patch (no relation, but I wish I thought in .ASM as Steve seems to do) scaps unwanted telemetry, but I like it. Start with this link to his main site: https://www.grc.com/x/news.exe?cmd=article&group=grc.spinrite&item=10500&utag= which features Spinrite 6.1, the latest relese of his famous disk maintenance product and just wander around the site. Somewhere in there you will find a registry fix which kills Win10 installation attempts, as of at least two or three months ago. Remember, WinX is poison for your computer! I dislike telemetry I don’t have complete, obvious, explicit control over, so another site I like is GWX Control Panel, but at some point you really need to understand a lot about tlemetry because more and more MS, Google, Android, IOs, etc.–based products dependon it as a revenue source — they sell info about you and/or your computer that you probably don’t know they can gather. GWX is not so much an anti-MS-telemetry site as is is an antiWinX infetion immunization site. One musr remember that MS would not have been giving away WinX (and pushing stealth ugrades to said OS on users of WinVista, Win7 Sp-whatever and Wiin8.*. I don’t know much about WinVista, excepotthat it was defective by design. It came with an inexpensive laptops I got for Mom (may she R.I.P.) and by the time I got far in removing the crapware, I just installed Win7 SP1 to replace Vista, which was so brain-damaged to begin with that even Microsoft avoids proclaiming responsibility for it. I guess what I have to say, in summary, is to look at GRC.com and then go learn enough x86/x64 assembly language to truly understand how low-level root-kits and malware such as a lot of the crap MS wants to foist upon your computer with its more recent Winblows OSes is done, how to spot it, and how to squlech it. With the inside the industry connections to people who know what is relly going down with products such as WinX, Woody provides an invaluable source of information you can get for free, even if your employer doesn’t subscribe to Infoworld or whatever. P.S. I miss the days when Byte and PCWeek were serious publications. That might be because stacks and stacks of paper publications used to make my office seem like a busy programmer lived there. Those publications often made me a more effectiveprogrammer, but partially because it helps to take a break from the troublesome code you are working on and just keep up with whatever industry evils/miracles are appearing on the marketplace. InfoWorld did not make a lot of sense to many geeks I knew who grew up with PCs, but it did to me, because I’ve actually written code for an IBM 370 (much improved version of the IBM 360 that corporation bet is farm on and won bigtime. How can it be possible to just “preview” an update? It installs it… or it doesn’t. You can’t “not install it… but just let me preview it, instead”. MS just gets more and more confusing. You can install them in a virtual machine. All of these Rollup updates are failing on my Server 2008 R2 boxes. Any idea why? Everything else is patching fine.